I read this article and found it very interesting, thought it might be something for you. The article is called How India’s Airport Body Earns 20% Of Revenues For Doing Nothing and is located at https://archive.indiaspend.com/sectors/how-indias-airport-body-earns-20-of-revenues-for-doing-nothing-26520. 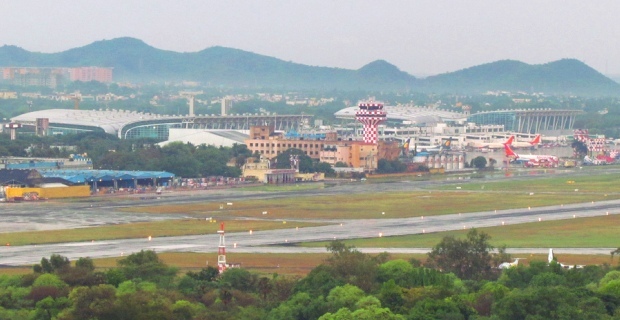 After much delay, India’s state-owned Airport Authority of India (AAI) recently concluded the rebuilding of Chennai and Kolkata airports, spending more than Rs 4,000 crore in the process. Almost within days, the AAI was being pummeled with criticism for a variety of defects ranging from glass panels cracking (Kolkata) to ceilings falling apart (Chennai). There could be several reasons for poor workmanship including poor supervision or insufficient funds. Which brings us to the question we are posing here: Is AAI badly off? Or, should it be running airports at all or would it be better off just administering airports for a fat fee? Both Mumbai and Delhi airports were privatised a few years ago. But it’s not a complete privatisation – AAI has a 45% claim to the revenues of each of the airport companies, Mumbai International Airport Ltd (MIAL) and Delhi International Airport Ltd (DIAL). 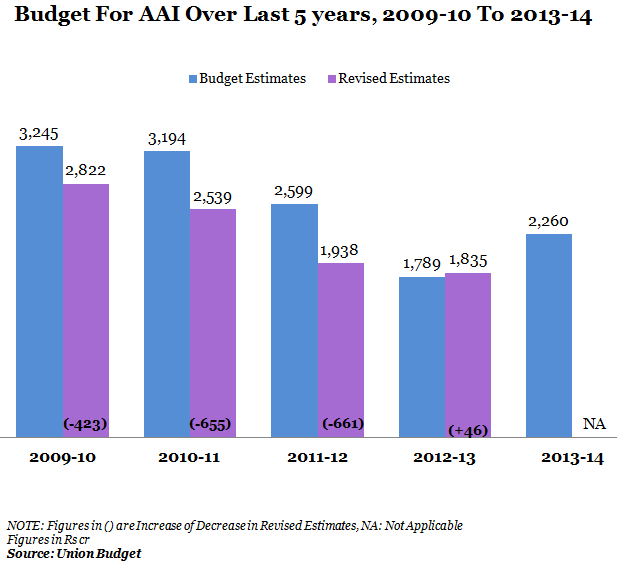 In the last 5 years, the AAI has earned Rs 4,749 crore thanks to its share of revenue. 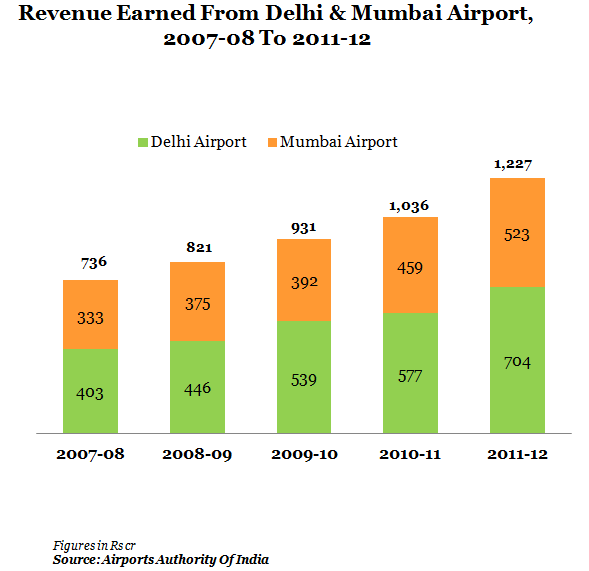 More specifically, since 2007, almost 20% of its current annual revenue comes from its stakes in Delhi and Mumbai Airport. And a small amount from Bangalore and Hyderabad airports where it has a 13% stake. The total revenue earned by AAI has been Rs 4,749 crore, of which Rs 2,669 crore (around 57%) is earned from the Delhi Airport. The contribution of Mumbai Airport has been Rs 2,082 crore. AAI has no operational role in these airports. 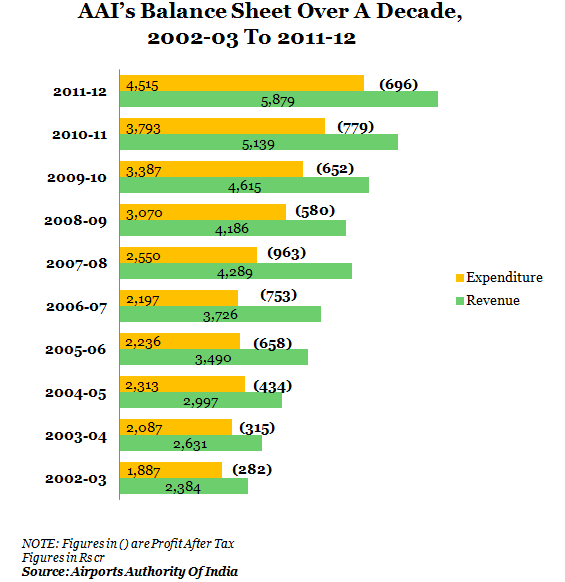 Here’s a look at AAI’s overall revenue, expenditure and profit after tax over a decade; i.e. from 2002-03 to 2011-12. Total revenue for the last 10 years has been Rs 39,336 crore while the expenditure has been Rs 28,035 crore while profits for the period were at Rs 6,112 crore. The revenue and expenditure has seen a steady rise but the profit majorly decreased in the year 2008-09 (by Rs 383 crore). 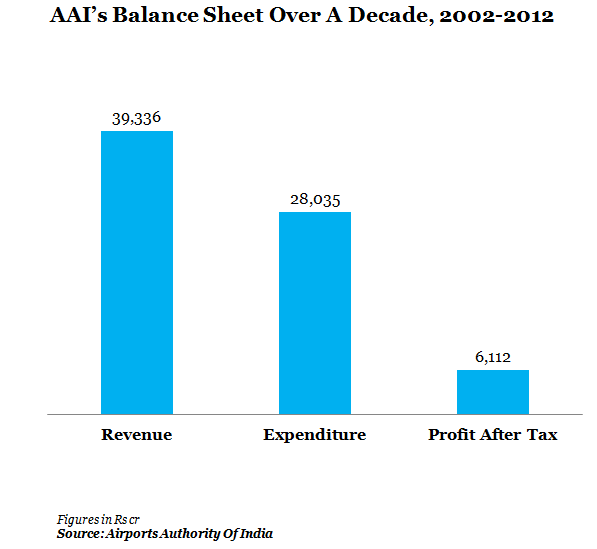 Incidentally, we do not see much of a rise in the revenue of the AAI after the inclusion of yearly revenue from privately managed airports since 2007-08. Around Rs 13,087 crore has been budgeted in the last five years while the revised estimates had been Rs 9,134 crore (revised of 2013-14 excluded). The revised estimates have gone down from the Budget estimates for almost every year barring 2012-13. The numbers seem to suggest that privatisation has not just helped lighten AAI’s financial burden but also brought it considerable income with which it is able to invest in other airports. But the moot question then is: should AAI be running other airports too or hasten privatisation where feasible? Yes, private players will not rush to grab all airports. But they could surely take over Chennai and Kolkata as is being talked about. And a few more. And ensure that glass doors don’t break and the toilets are clean. Shifali, thanks for your comment but not sure what your point is. The article is on the revenue earned by the Airports Authority of India (AAI) by virtue of its stake in Mumbai & Delhi airports, not whether Delhi airport loos are better than Chennai. The Kolkata, Chennai airports were inaugurated recently and hence there is some public gaze on their amenities or the lack of it. To reiterate, that’s not the subject of this article. Thanks for presenting the statistics for AAI. However, you need in-depth analysis and understanding of the Airports Sector in India to reach any conclusions. Your inferences are superficial as it misses the most important point that Delhi and Mumbai Airport privatization included ‘big’ sweeteners. DIAL was given a huge amount of land for commercial exploitation. A simple comparison of the existing scenario with a case where AAI were given the same authority and sweeteners for Delhi Airport will show the huge loss AAI is currently in for this airport. Its important to note, that while DIAL uses its profit for ‘itself’, AAI uses its profit to develop other airports in the country that private companies don’t want to touch. I agree with Sourjya…. but i feel he should have gone a step further and said the obvious. That the AAI should stop wasting money on airports which don’t make commercial sense. In India we should look to increase the productivity of the economy. If we need to increase the productivity we need to deploy scarce resources to jobs which fetch better returns. Yes AAI needs to be scaled down.